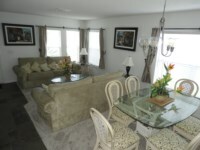 4 bedroom, 3 bathroom villa in the Four Corners community. Owned by Gerry and Sue Reed. Ref: 3452. Please click on the calendar symbol below to check availability. 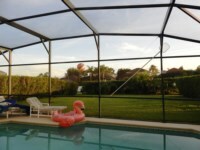 Palm Trees is a family owned villa and we love to use the villa for our holidays. As our family ranges in age from 1 year to 84 years old, the villa really is suitable for all ages. Our youngest daughter is autistic and as she grew up, holidays in cramped hotel rooms became increasingly difficult so our own familiar villa with loads of space was the ideal answer. A place where the whole family could feel at home. 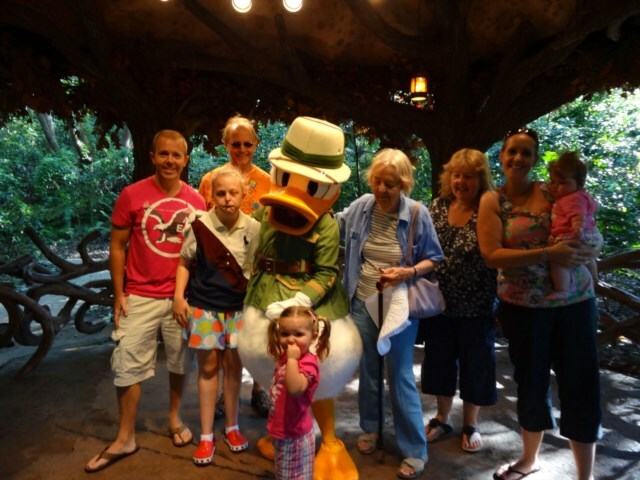 Now our other children and our grandchildren love to have holidays there and it is a great place to spend time with our grandchildren. Every time we visit we upgrade at least one room, and we love to shop for additional items for the villa, so that the villa feels like a home not just an impersonal holiday rental. Our favourite time of the day is the early evening, sitting by the pool, watching the sun set and relaxing with a drink in our hand while the BBQ cooks. We love our time spent in Florida and will do all we can to ensure you have a great stay in Palm Trees so please contact us with any questions you have. For privacy reasons, the marker on the map shows the Four Corners community location and not actual villa location. Palm Trees is a luxury 4 bed villa, with a large sunny garden - surrounded by shrubs and palm trees. 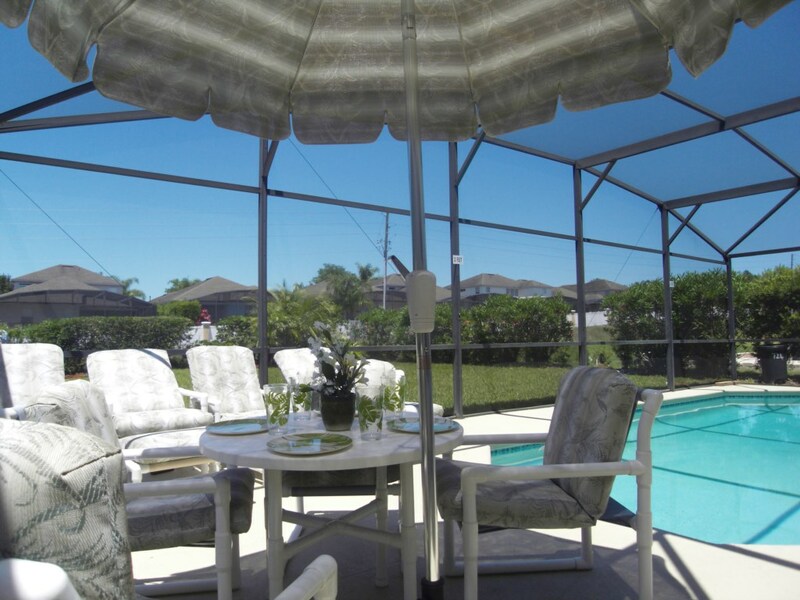 The villa has a private pool with optional heating and heat retaining cover so that it can be used year round. 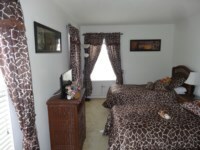 The villa is furnished to a very high and comfortable standard. Our local management team keep the villa spotlessly clean. It is very spacious ( larger than many 5 bedroomed villas ) and well equipped for up to ten people - you wont need to keep putting the dishwasher on because you've run out of mugs !!!. It is our family home from home and we like our comforts !, so it has all the little extras that make a house a home. We spend lots of time living in the villa with our family (aged from 1 to 85) so understand all the little extras you need to make your stay comfortable. 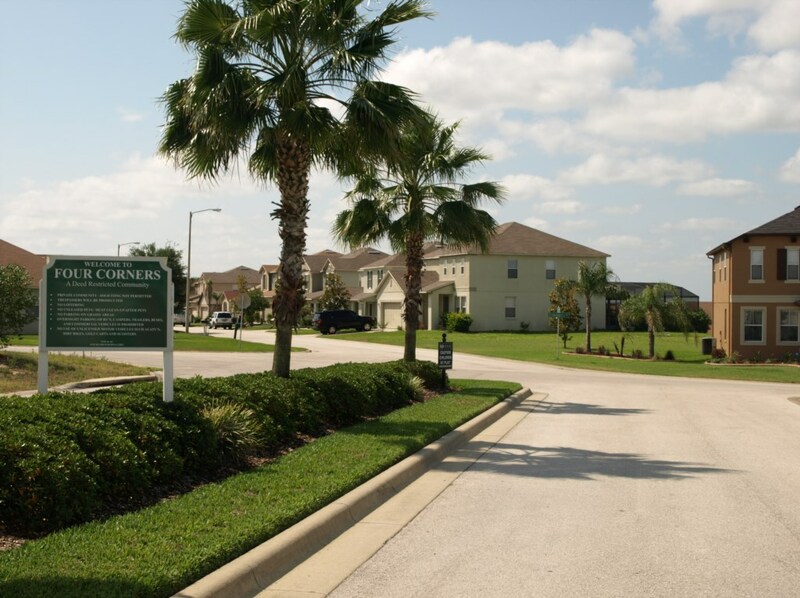 Palm Trees is in the peaceful Four Corners community, yet It is ONLY 15 MINUTES FROM DISNEY, and 5 min from Champions Gate golf complex. There are plenty of shops and restaurants within a few minutes drive. The villa has a secure WiFi Internet system - just bring your laptop, tablet, smart phone etc. Phone calls to land lines in the US and UK are included in the price so you can keep in touch with home. A telephone with all local, long distance and international calls (to land lines) free of charge. We want you to have a great holiday and will do all we can to make it a fantastic vacation. Yes, you will find a cheaper villa if you only want basic accommadation but you won't find better value if you want comfort and space on your holiday. DOWNSTAIRS the main living area is open plan. There are two separate lounge areas, one with a double sofa bed ( beds 9 and 10) and entertainment centre with large flat screen, upgraded cable service, HD TV ( channels like Fox sport with many UK football games), surround sound, DVD/bluray player and film library. 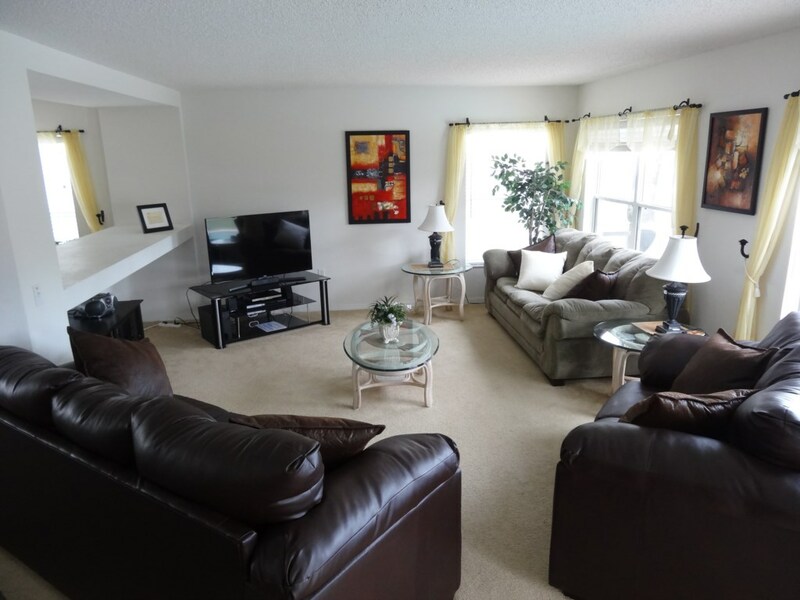 There are plenty of comfortable sofas, a full dinning table and a smaller breakfast table next to the kitchen area. The fully equipped, updated, kitchen has granite worktop, new fridge/freezer, micro-wave, dishwasher, full cooker, coffee maker etc ( yes there is a tea pot!). and breakfast bar for quick snacks. 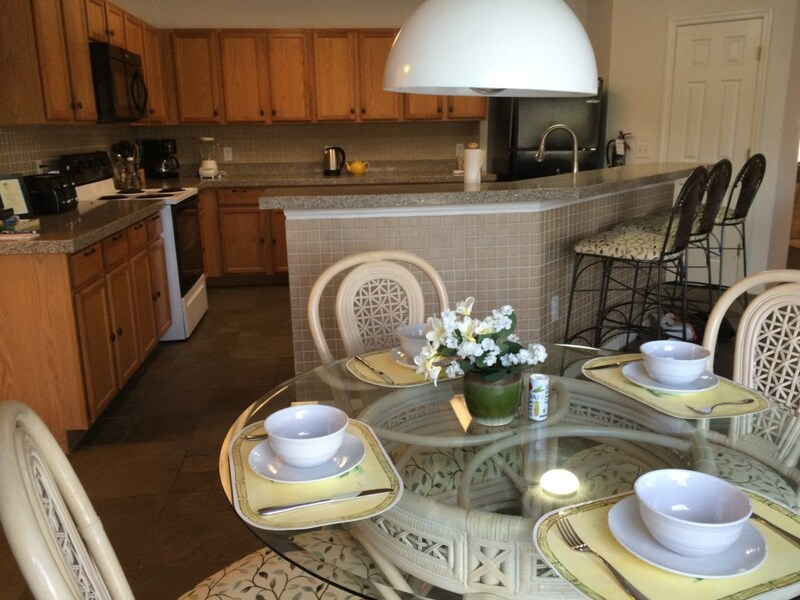 We find it most relaxing to eat around the pool most evenings and so the kitchen has all the little extras that many rental homes do not have like a bottle opener, ice cream scoop and plenty of baking trays. The villa has a monitored alarm system and safe for guests use. 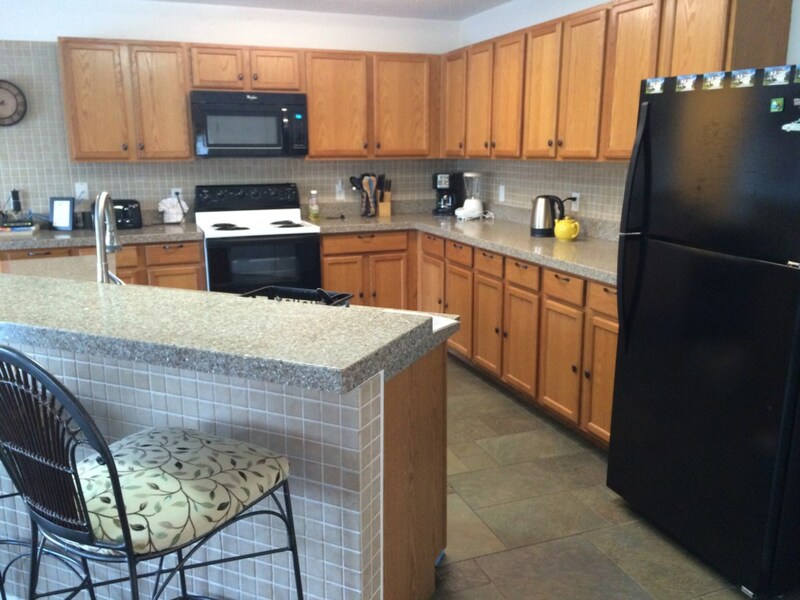 From the kitchen and breakfast area, patio doors ( with a child alarm) lead out to the pool and sunny garden. The pool has a child safety barrier and a cover to retain heat in the winter - optional pool heating is also available and recommended from late September to May. There is a gas B.B.Q and comfortable garden furniture on the decking. The pool area has plenty of lighting so that you can see to BBQ or swim after dark on warm evenings. Behind the pool area is a private garden giving the pool an open, sunny feel but with the added privacy ( that many villas do not have) of a shrub and palm hedge. The plants and flowers in the garden attract many birds - we have seen humming birds feeding on the flowers, Sand Cranes, Cardinal birds, Egrets etc in the garden, but we are well away from any lakes with their unwanted wildlife. There is a downstairs shower room with toilet - ideal when you come out of the pool, and a utility room with a washing machine, drier, iron etc. Palm Trees has a dedicated GAMES ROOM with table football. 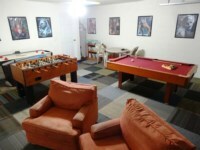 pool table, darts, PS2 with games, TV, DVD player and box games. The games room also has armchairs so you can play the PS2 in comfort. Unlike many villas Palm Trees has two floors increasing the space you have . 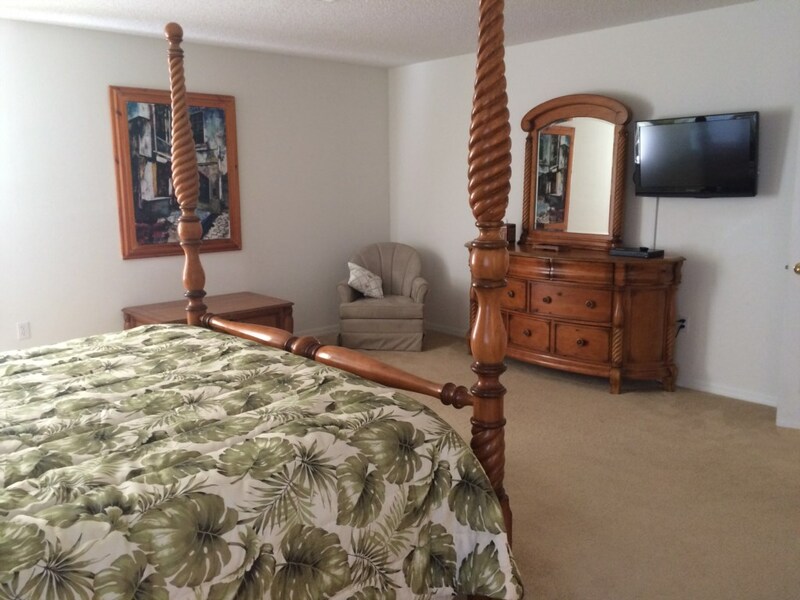 UPSTAIRS the large, double aspect, master suite has a huge (6ft) and very comfortable, four-poster bed, a cable- flat screen television, Blu ray player, full bathroom with his and hers sinks set in marble, bath and walk in shower cubicle. 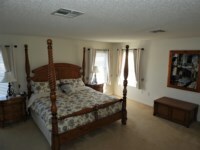 There is also and a dressing room with hanging rails - lots of room for all your Florida shopping !. All the bathrooms have hand held hair driers and towels for your use in the villa. The second double room has a comfortable queen bed (5ft), flat screen cable TV with DVD player and all the usual cupboards, draws, bed-side tables etc. 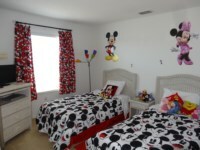 There are two twin bedrooms one of which has a Disney theme ideal for children of all ages - with coloured lights, Mickey curtains, TV and DVD player with children's films. We also provide bed bars, magic bumpers, stair gate, folding door gate, high chair and a travel cot(crib) for our younger visitors. The second twin room is a lovely, very sunny, double aspect room, also with a flat screen cable TV and DVD player. 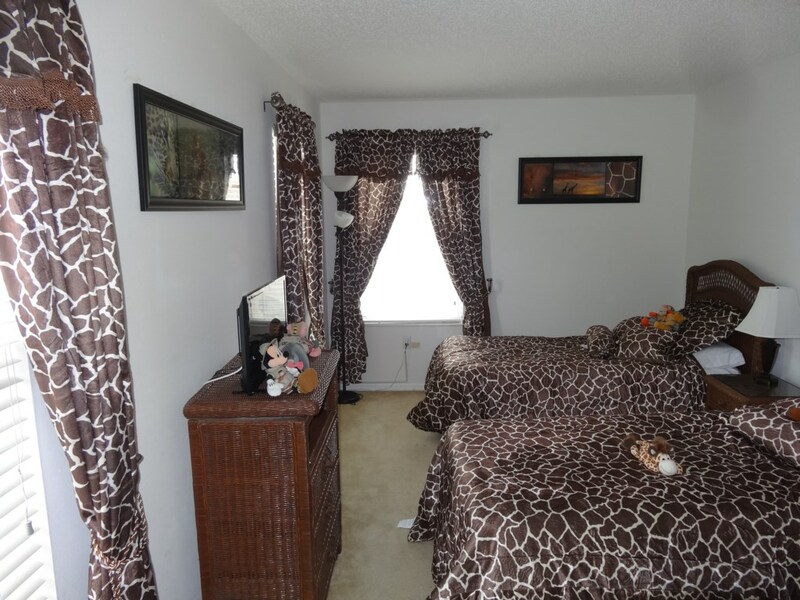 This room has a Disney Animal Kingdom theme. There is an upstairs den area with a book and travel guide library, a comfortable sofa - a quite spot to sit and read while the children go to sleep, and the children's DVD collection. 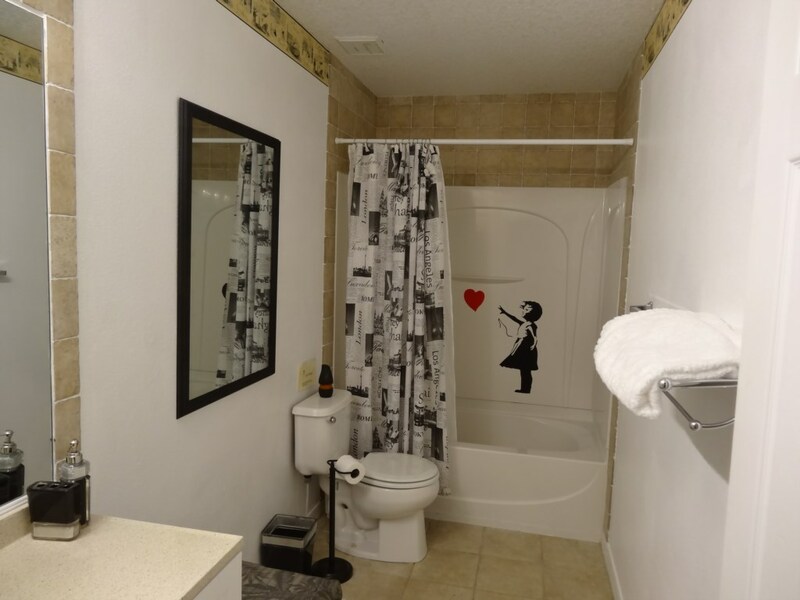 There is also a large second (family) bathroom upstairs. 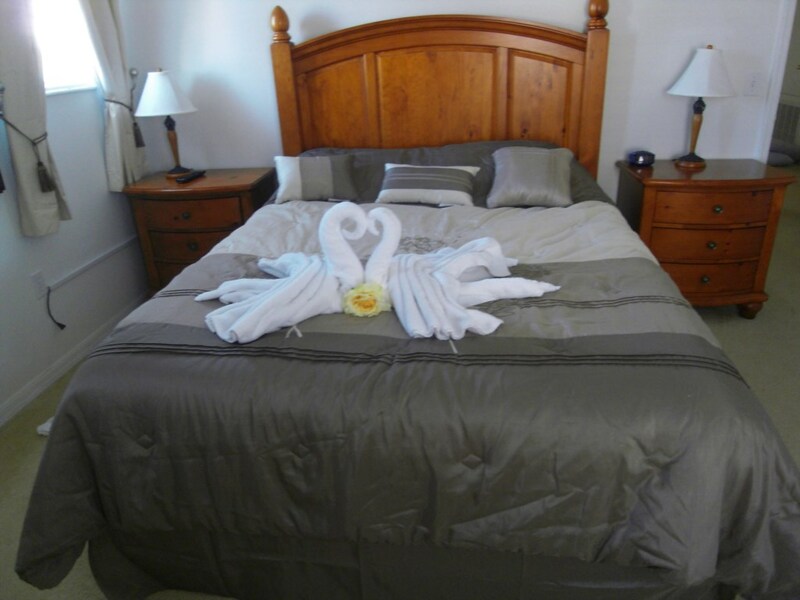 All bathrooms have plenty of white towels for use in the villa and around the pool, hand held hair driers and toiletries for your first couple of days to get your holiday started. We provide spare linen, cot linen and beach towels in our owners linen cupboard. 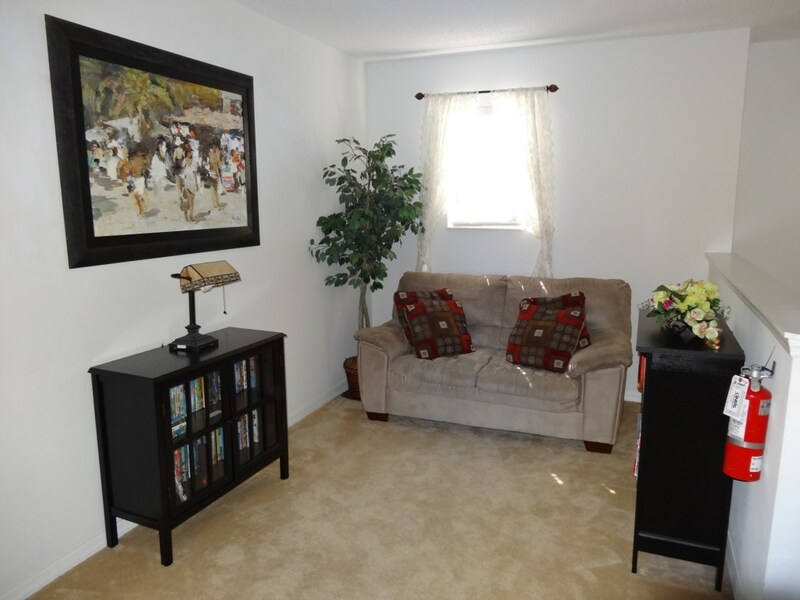 Palm Trees is ideally situated only 15 min from Disney but in a peaceful community off the H27. The area around Four Corner has a great choice of shops and restaurants. 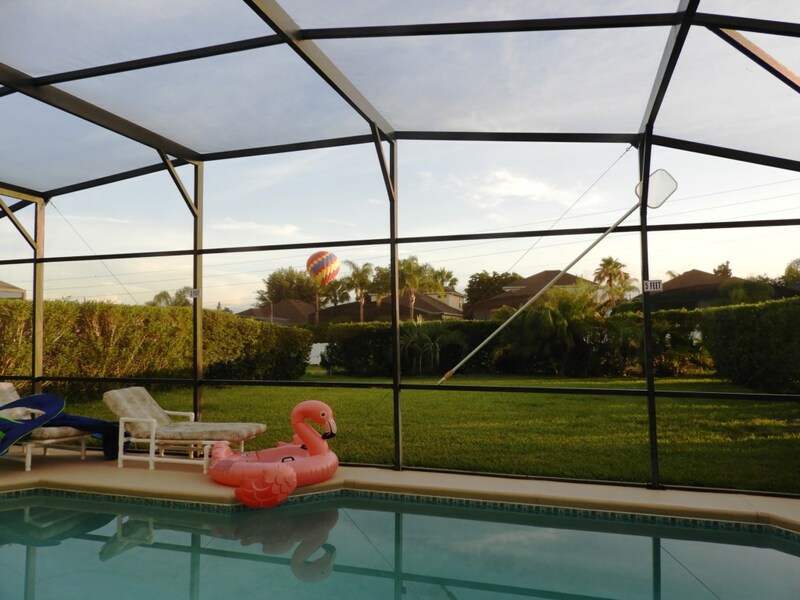 The villa is only a couple of minutes from two I4 junction and therefore ideally placed for trips to both the west and east coasts of Florida (about 90 min drive to either coast). There are many golf course within a few minutes drive including Champions Gate. The price is for the whole villa, not per person - we can not use A/C in half the house, insure and licence half a house, heat half a pool etc. Pool heating is an optional extra. £80/$120 per week, recommended October to May - summer rate also available. Stays of less than 7 nights will may have a cleaning charge of £60/$100 added. Over peak periods, Christmas and Easter the minimum booking is 10 nights. Booking is easy. You just need to fill in a booking form and pay a deposit (variable but usually around £250/£300 - depending on length of stay) The balance will be due 8 weeks before your stay. We do also ask for a refundable damage deposit of £300 while you are in the villa. When the balance has been paid I will post a welcome pack with directions and maps etc. 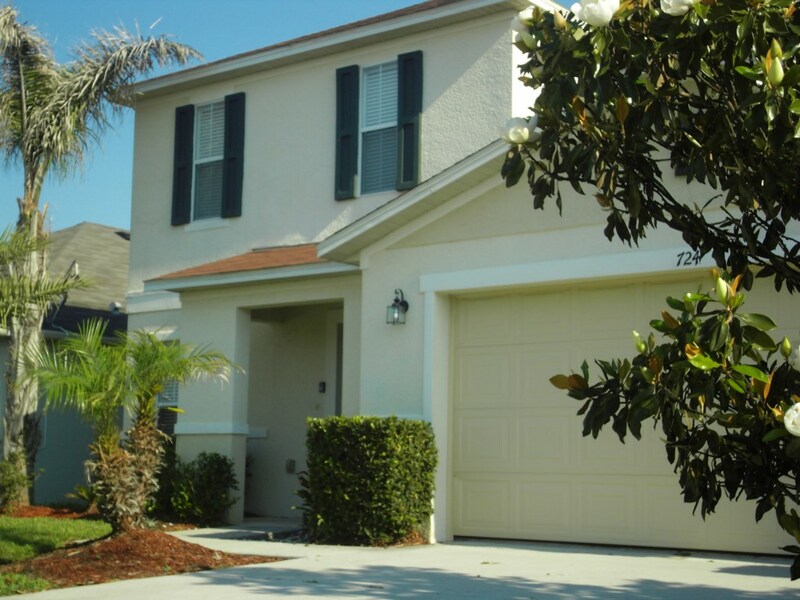 When the damage deposit is paid (about a week before your stay) I will email the access and alarm codes for the villa so that you can drive straight to the villa when you arrive in Orlando. We can take payments via direct bank transfer (UK £ or US $), cheque ( £ or $) or credit card (via Paypal) with a small admin charge. We are very happy to talk or email you if you have any questions. 22 Jun 2019 to 29 Jun 2019 - use the form below to enquire about these dates. 04 Sep 2019 to 12 Sep 2019 - use the form below to enquire about these dates. Average rating: 5.0 / 5 from 12 reviews. This villa is perfect, there are so many reasons this is the best. Firstly the communication between palm trees villa is quick, efficient an offered very helpful advice as my family and I were first timers meaning we had quite a few. Secondly the villa check in was very good being able to drive straight to the villa. Now finally the villa, every room was clean tidy and had the wow factor which after a long flight and arriving very late was fantastic to see along with all the bed made ready to jump straight in. The villa offered a highchair, a travel cot and stairgates all making it easier for me with my youngest. The games room was perfect for the older kids in the evening although the most used part was the pool, the pool was heated and so nice and clean. The downstairs bathroom being perfect for the kid's quick dashs to the toilet in between swimming. In fact everything the villa had to offer made the holiday more enjoyable and fun from the DVDs collection to simply the extra blankets. There is not one aspect on this holiday that I had a problem with, the only thing I didn't enjoy was having to say goodbye to come home at the end of the holiday. 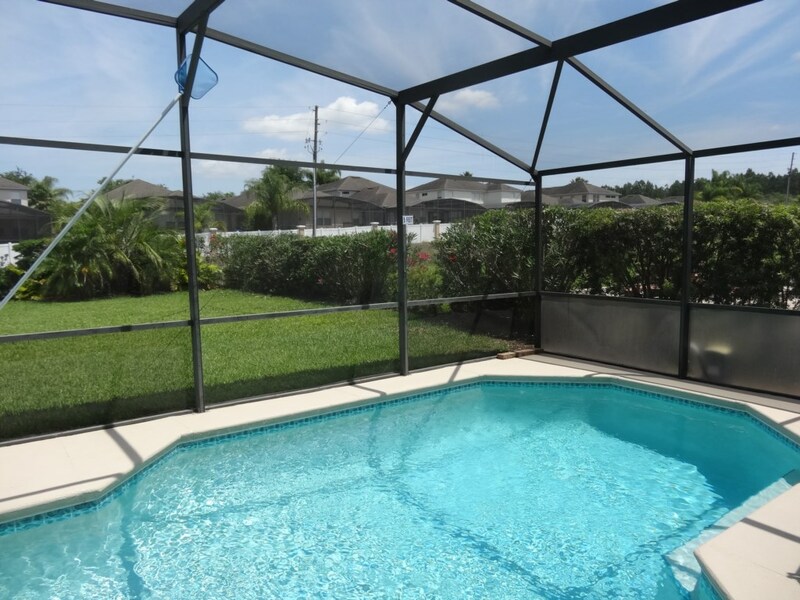 Now only will I definitely booking to revisit this villa again but I highly recommend this villa to anyone and everyone who is looking for that perfect place in Orlando. Beautiful home. Just like photos and description. Truly impressed. I cannot recommend this villa enough! As a family of 9 (me, my husband, my mum, my brother, his wife and their 4 children aged 6-11) it was perfect. There was so much space for everyone and kids absolutely loved the pool. 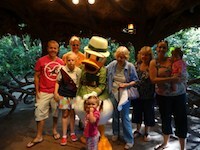 In fact, they would have rather have stayed at the villa than go to the parks! It was our first time in Florida and our first villa - and I shall definitely be doing it again. The games room was great for all the kids and they had a great selection of DVDs to watch in the evening. The kitchen had everything you could possibly need, and it was so handy having the washing machine and tumble dryer - I came back home with hardly any clothes to clean! Sue was so helpful from start to finish. We booked about a year in advance, and she helped me with so many questions - even things that had no relevance to the villa. She helped me out with any problems efficiently, and even took the time to call me at early hours of the morning. The customer service was impeccable. 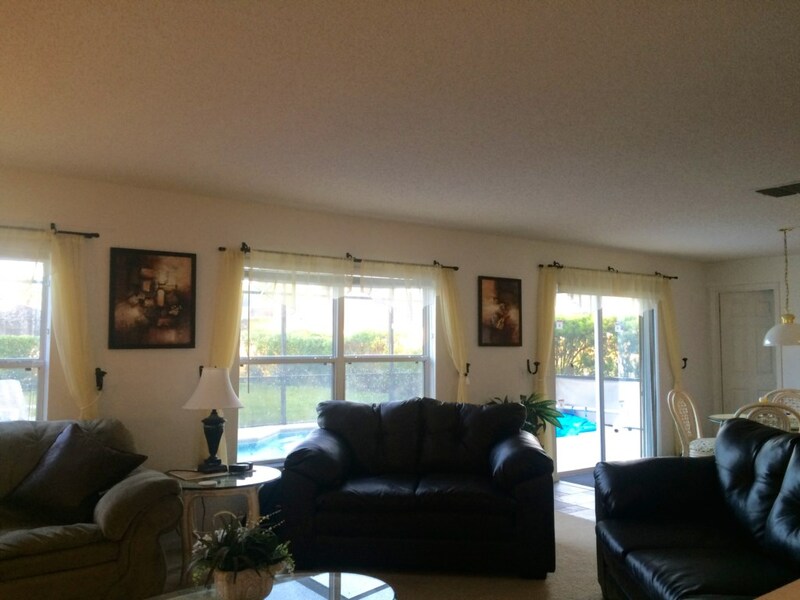 If I get the chance to go to Florida again, I would not hesitate to book the same villa It was a home from home. Comfortable, clean, cosy. What more could you ask for! The area of Davenport is also lovely. We went to Walmart most days as it was nice and easy to drive to from the villa. It was about 20 min drive to Disney and about 25 min drive to Universal. Both in easy reach. Just cannot fault the villa or service. One very happy customer :) Thank you Sue and Gerry. You were part of our best holiday ever! Owner's response: Thank you Victoria. To anyone who is thinking of hiring a villa instead of a hotel, then we can certainly and sincerely recommend this villa. It is a large villa with a superb pool and although there was only the two of us, this villa is equipped for a large family with everything available that you need. The location does need a car otherwise it is not easy to get about, but other that that, the shops that you need are a 5 minute drive and of course for those of you with families needing the theme parks, the are about a 15 minute drive away and so easy to get to. For those of you like me who are golf minded, then this is certainly the place for you, with far to many to mention if you want to play. I would also say for those of you with a good size family there is also a garage full of stuff for the kids to play with, like pool, air tennis and a TV with a games console, which one I have no idea but it is there. There is also a huge selection of DVD's for adults and kids alike and plenty of TV channels to view including premier league and Golf, needless to say lots to do in the evenings. I can sincerely say that we thoroughly enjoyed the villa and the pool and had a very relaxing holiday, Gerry and Sue are just an e mail away if you needed anything also, but I doubt that you would. Lovely House and Great pool. Stayed for two weeks in this large Beautiful house with Great pool. Everything you could need available, all excellent condition. and restaurants a couple of miles away. Sue quick with any queries and very helpful should you need any advise. Would recommend this letting without hesitation. A perfect villa with everything you need. We were thoroughly impressed with everything about the villa, how easy it was to book and how quick we got responses from Sue regarding any questions we had. The villa has everything you could possibly need for a lovely stay, everything was absolutely spotless upon arrival and there were enough games etc to keep a 4 year old entertained the whole time. The DVD collection was perfect for both adults and children. 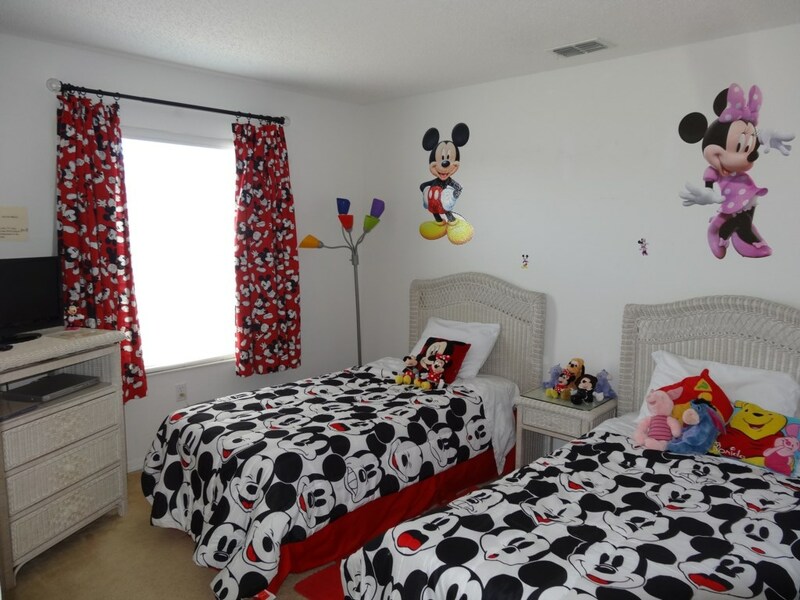 We recommend this villa to anyone who wants somewhere close to Disney Parks (20 minutes) but also in a lovely quiet surrounding so you can relax by the pool. Thank you Sue and Gerry, we will 100% return to your villa! This villa was simply "wow". We have stayed in many villas in Florida, but this was by far the best. There were only two of us in the villa, but even if there were 8/10 there was so much room that everyone would have been comfortable. Loads of comfortable seating downstairs and the upstairs, with its 4 bedrooms, 2 bathrooms and HUGE landing area was amazing. Kitchen had absolutely anything you could ask for, and the pool was brilliant. Would recommend to anyone. Perfect. We had the pleasure of staying in this fantastic villa for 16 nights in mid March. 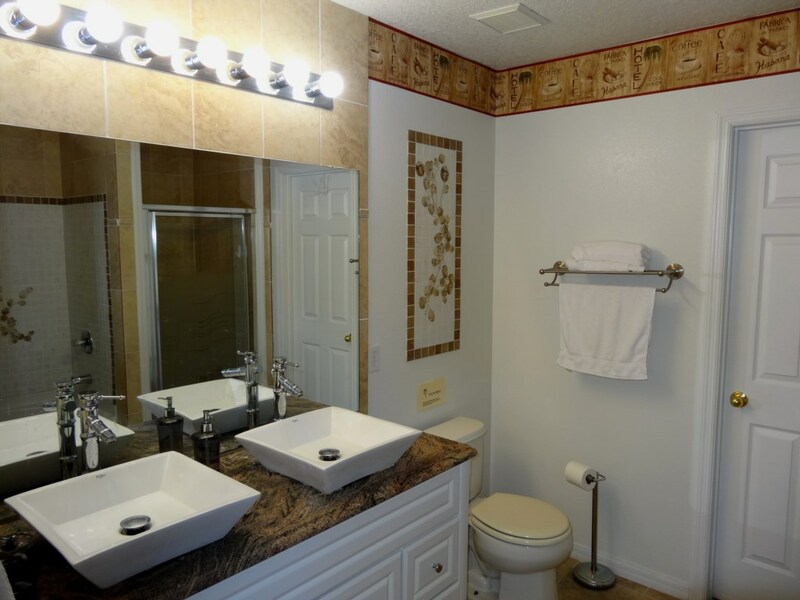 It has everything you need for a great stay in Orlando and we would definitely book again. The villa is spacious, very clean and tidy, the pool area was lovely ( we had the pool heated), there were 5 of us and we never got under each others feet because of how big the villa was! 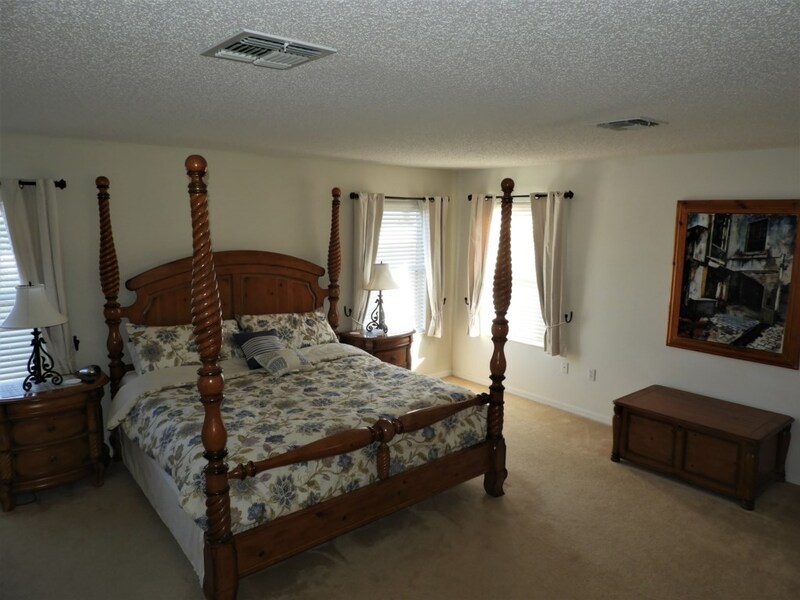 Four Corners is a lovely quiet area in a great location for Disney and all the parks and to access the I4 if you want to go further afield. There are shops and bars within 5 mins drive and a big Walmart about 7 mins drive away. We absolutely loved our stay at this villa and didn't want to come home. Gerry & Sue are very easy to deal with and were very prompt to respond to any questions we had. The only thing I would say is that the pictures of the villa on the website do not do the villa justice, its even better than it looks! Thank you for the use of your amazing villa. We had a great time and my grandkids loved every minute. Everything you needed and then some in this house. It was very inviting and made you feel like you were in your own home. 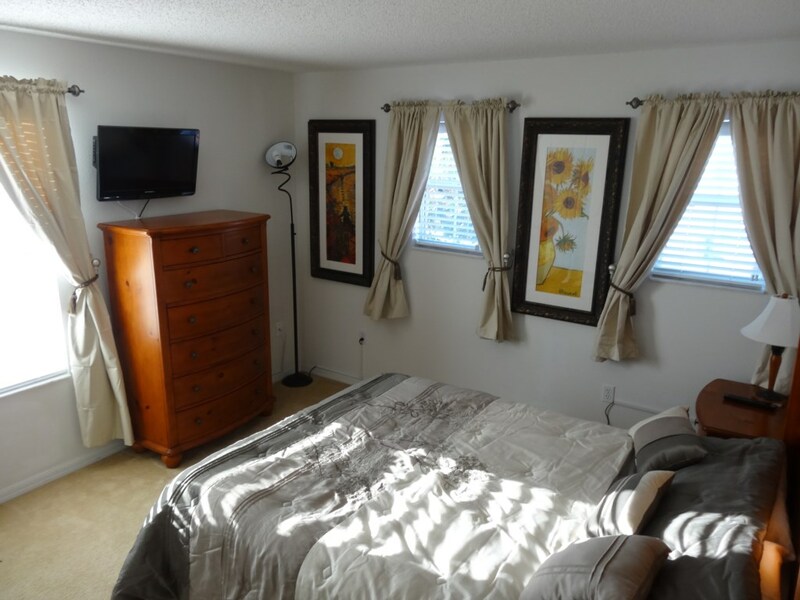 Very spacious and well furnished. Made you feel warm when you were there. Would love to go back. We had a fantastic holiday and if we decide we are going back again we wouldn't hesitate to use Palm trees again. Your enquiry will be sent to villa ref 3452 only. This page has been viewed 44135 times since 05 May 2011.